At first glance these photos look like one-dimensional framed works. But if you look closely, from another angle you will see there is depth and layers to each one. Just like a person, we see only the outside layer. Untill we look closer, we begin to see all depths of another. “My Diary” is an personal look at my life. With layers of photos, drawings, and flowers I have collected. The exhibit will be on display the duration of April at Gimme! Coffee on North Cayua St. in Ithaca, NY. For more photos of the exhibit check out my picasa album. This entry was posted in MISC and tagged collage, drawings, flowers, gimme! 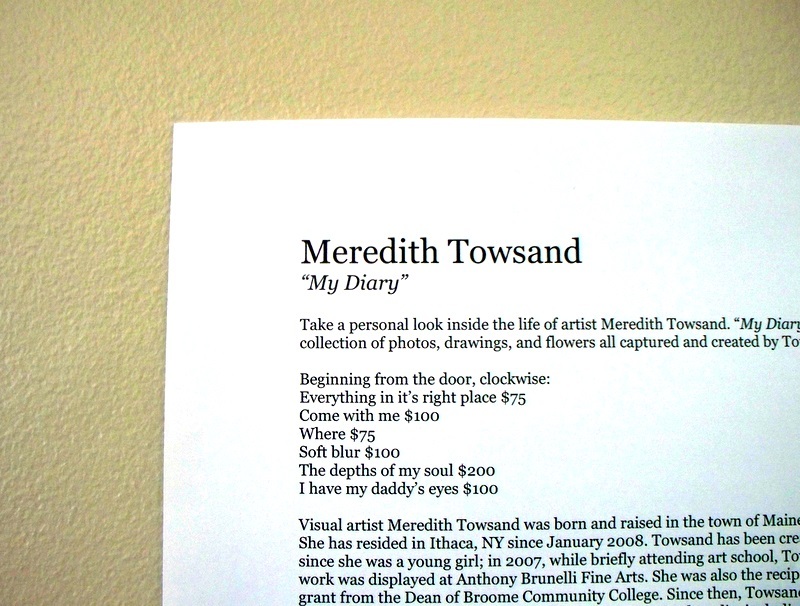 cofee north cayuga st, meredith towsand, my diary, photos on April 7, 2010 by Meredith C. Bullock.